Trading strategies use the most accurate indicators and accurate tricks for binary or forex trading on iq options, one of which uses the Bollinger Bands indicator. The most accurate trend indicators that are often used by traders are Bollinger bands, and will be even more robust when combined with other indicators. Basically, all indicators are good, depending on the traders who use them, so choose and use indicators that are appropriate for each trading style. Bollinger Bands is a useful indicator to help measure market volatility and estimate the range of normal price movements (range). When the price movement exceeds the normal limit, that's where we use it to take trading positions. The Middle (midline) line on the base is the line from the Moving Average indicator with period 20. It functions as a calculation basis for Upper bands and Lower Bands. The distance that occurs between Upper Bands and the Lower Bands is influenced by the volatility that is happening. The wider the distance between Upper Bands and Lower bands, the greater the volatility that occurs, and vice versa. Bollinger Bands helps traders to analyze whether the market is crowded or quiet based on the volatility that appears on the indicator. This simple strategy utilizes the Upper Bands Line and Lower Bands Line as support for dynamic resistance and support. Price movements will tend to bounce back to the middle (middle) after the price reaches the upper line (Upper) or the lower line (lower). With Bollinger bands, we can find out the breakout opportunities. As I explained above. Bollinger bands tend to narrow if the market is quiet, which means that market participants are not sure where to go. The Seller and the Buyer are equally strong, eventually the price moves in a narrow distance. 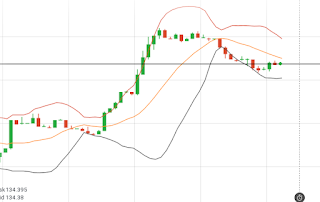 The movement of Bollinger bands also narrows. Breakout that will occur is marked by the movement of Bollinger bands (Upper and lower) quickly / suddenly widened and the price penetrates the Upper or Lower lines. Fractal, Parabolic SAR, and Stochoastic Oscilator.The signal entry is: when all the indicators we put show the same entry signal.Previously we had to know each signal entry on the indicator that we would use. 0 Response to "Secret Techniques Setting Indicators of the Best and Most Accurate Bollinger Bands"